We caught up with Blouse's Charlie Hilton a few days before the madness of SXSW and chatted about the sophomore record Imperium, (out now on indie label Captured Tracks), touring life, SXSW and pizza. Blouse is a band that is not afraid to evolve and the progression from their self-titled first synth heavy album to a more organic sound on Imperium is authentic and fun to experience. 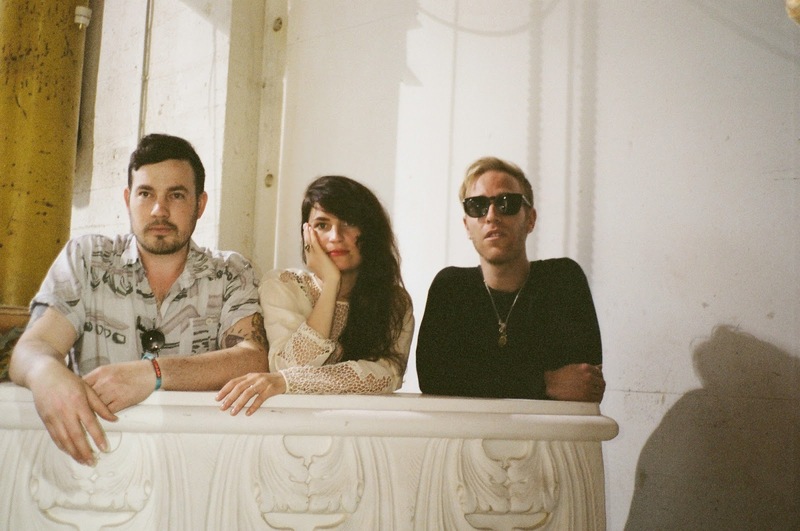 Blouse will be playing the Empty Bottle on Monday, March 31st with Dum Dum Girls and Radar Eyes. Hopefully you got a ticket already because the show is sold out. WCR: You guys are playing in Albuquerque tonight, right? CH: Yes. We just played Phoenix last night and we’re on our way to Albuquerque tonight, then we’re heading over to Austin, TX. Last night was the third show of the tour with Dum Dum Girls. You just started the big North American tour with Dum Dum's. How’s that been going so far? It’s been really wonderful! They’re such cool girls. We’ve been having a really good time. How would you say it’s different than the other tours you’ve done? The shows have been packed! I know Dum Dum Girls have a good draw. I think a lot of the venues on this tour are going to be either sold out or really crowded because they are smaller venues. I think Dum Dum’s could have played in bigger places but it’s nice to know you’re going to pack pretty much every room and have a really excited crowd. It just feels better to play when it’s like that! It just makes it exciting because you know what to expect and there’s not a mystery as to how many people are going to be there, which is always nice. At the end of the day we just want to be playing for people. You put out a new album Imperium back in September. It’s definitely a more organic and less synthy sound than your first album. What made you decide to move in that direction? It started off because the producer Jake wanted to play more guitar on the record. He and I had done a lot of the synth parts on the first album and he kind of joked around that the synths were too heavy and annoying and he didn’t want to tour with one, so that’s how it started. Then as we continued talking about it we decided that sonically, it would be really interesting to just try something without the synths and it seemed like a really good challenge. Just sort of change the formula up a little bit on the second record. It’s an interesting thing going into a sophomore record, because you have to compete with yourself. You don’t want to repeat what you’ve done but you also want to stay true to your sound. It seems really good to carve a specific path for ourselves. And I’m glad we did it, I’m really happy with the results. So, it was a conscious decision, it didn’t just happen? No, not at all. I mean, I wasn’t sure if it would work and if we would get through it, but we pulled it off. It was very self-aware. What would you say are the biggest differences between how you sound on your albums vs. how you play live? I think live, it’s a lot louder and just more powerful and energetic. When we play live, we take the songs to a different level, which is really fun to do with the more guitar heavy songs. But we still play songs from the first record and I think those songs are pretty powerful live, too. It’s nice mixing the two sounds because our set feels really dynamic right now and every song feels different, which is refreshing for us and the audience. If pressed to define your music by one genre what would you call it? I was just thinking about that and I’m actually really bad at talking about music, but most other people have called it dream pop? Whatever that is seems to span all of the sounds we’ve made. It’s not the most exciting term but I agree with it. Nico is one of my biggest influences in terms of my singing and I love the lyrics of Leonard Cohen and Lou Reed. We were really obsessing over Galaxy 500 when we started the band. I don’t think I could listen to that band enough! I like mostly older stuff and I really love the Modern Lovers, Jonathan Richman, David Byrne … people who have really interesting voices and really well thought out lyrics. Those would probably be my favorites. I can tell that you love the well thought out lyrics. I love that song ‘1000 Years’, what was the influence for that song? You know, I just wanted to write something that was really comforting, almost like in a psychedelic way. I was thinking about being in an opium den or if you were feeling pain and someone was singing to you and telling you that it was going to be ok, that’s the kind of song I wanted to write. The paradox is you can’t love someone for 1000 years. It’s all ephemeral but in the moment you can feel something so eternal, like love, and being told that you’re loved. So you’re also playing SXSW in a few days. What are you looking forward to most about it? I think I’m most looking forward to seeing some friends I haven’t seen in a while. The nice thing about SXSW is there are just so many people in one place and when you’re in a band you just get to see a lot of friends and people you haven’t seen in a while because everyone’s there. Most of the people who I know who play music are going to be there. So really just the basics: seeing old friends and wearing shorts and swimming. We’re not playing that many shows so I’m looking forward to relaxing and listening to some other music. Speaking of that, who are you excited to see perform this year? You know what? Last time I looked at the schedule I was so overwhelmed and I didn’t know who 75% of the bands were, so I kind of just want to wander around and find something that I don’t even know. That doesn’t happen that often and I think of all places, SXSW is the kind of place where you could feasibly find new music that you’ve never even heard of before and be really surprised. I don’t really want to get into any of the really buzzy shows; I just want to find like weird little small bands in little holes in the wall. When was the last time you were in Chicago? Almost two years ago, we toured with Bear in Heaven and did two back to back shows at Schubas. I think they were sold out and it was great! I love playing in small venues and I think the Empty Bottle is pretty small. The first time I came to Chicago I was on a road trip with someone and we were downtown for a day and I was too tired to really make sense of any of it. But when we played those shows [at Schubas] I really saw a different side of the city and I’ve always wanted to come back. What are you most looking forward to about being back in Chicago? We never really have too much time anywhere so it’s hard to think of things you want to do because we probably won’t be able to do them. I think we’re staying in a hostel in what appears to be a cool neighborhood. Even if we have an hour I like to just wander around, especially check out the food. I’ve never really had the pizza that everyone talks about. Are people in Chicago actually really into the deep dish or is it just a tourist thing? People here are very into it! I’ll have it every now and then but it’s a LOT of pizza. Do you get to try cool places in the towns where you play? At the venue they usually have something for us for dinner but yeah other than that it’s gas station or we’ll try to find a Whole Foods. We eat sushi for breakfast a lot. We’ve been pretty lucky so far! Do you guys have time to have fun on the tour? I know your schedule is pretty break neck. We have so much fun! We’re all really close friends so the only time we don’t really have fun is when we’re carrying the gear in and out of the car. I mean, you have to have fun on tour. Especially at the support level, we’re not doing it for financial reasons. We’re here to play music for people and get some more exposure. Any time I get stressed out about logistics or anything I try to just keep myself in check because if you can’t relax then it’s kind of pointless. You get in kind of a rhythm though. The first few days are the hardest because everything feels kind of crazy but once you get in the rhythm of it, it’s actually pretty simple. Keeps my mind at peace because you’re moving around so much and everything feels very repetitive. There’s something really peaceful about it even though it’s pretty exhausting. Do you have any plans to get back in the studio after the tour? Not specifically. But I know I want to work on some new material. We haven’t set any specific plans yet, it kind of feels good to keep it open. I am in the process of recording a little record of love songs for the label. I’ve been talking about doing this with the label for two years so I’ll have the chance to finish that and I’m looking forward to it. It’s something a little bit more simple and organic sounding. Check out Blouse's "A Feeling Like This" below and catch them live on Monday night at the Empty Bottle.